A US Navy inspection found a number of ‘manageable’ problems in USS Wisconsin. Norfolk, Va. — An inspection by volunteers from the U.S. Navy’s Board of Inspection and Survey (INSURV) found a number of “manageable surprises” during a recent visit to the USS Wisconsin, a World War II-era battleship under the care of the Nauticus museum. John Elliker, Battleship Wisconsin project manager, said the city of Norfolk initially contacted INSURV to ask them about surveying the ship. The conversation progressed into the INSURV team volunteering their off-time to conduct an inspection to assist the museum in developing a plan to open more of the ship and identify potential hazards that could impact visitor’s health and safety. “What we want is for your grandkid’s grandkids to enjoy this ship in a meaningful way, and we can’t do that if we’re constantly battling rust and deterioration. This is the beginning of a unique partnership between the active duty Navy and the city of Norfolk for the preservation of the battleship,” Elliker said. The INSURV volunteers conducted the inspection January 25. 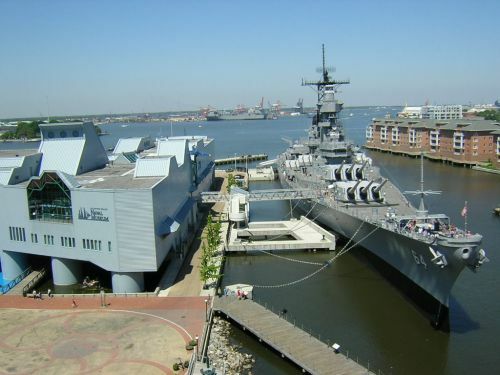 The battleship received its last official INSURV inspection in 1992, before becoming a floating museum on the James River.